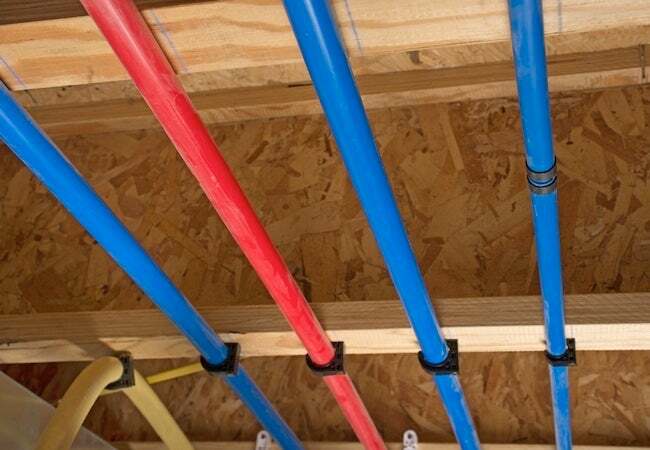 For many plumbers, it's clear that PEX tubing wins out over copper pipe, in terms of affordability, freeze protection, and ease of installation. But since there are multiple types of PEX, navigating the marketplace can be a challenge. For help understanding the options and their relative merits, we spoke to veteran PEX vendor SupplyHouse.com. Read on! For much of the latter 20th century, household plumbing systems depended on copper pipe—a difficult-to-master building material whose price only rose along with the ever-increasing demand. Today, many pros (and do-it-yourselfers) prefer to use tubing made of cross-linked polyethylene, or PEX. In addition to being cheaper than copper, PEX boasts the added advantage of being bendable. That means, compared to straight, rigid copper, PEX requires fewer connections and fittings, enabling installers to get the job done more quickly and with relative ease. Furthermore, once in place, PEX tends to fare better over the long haul, because durable plastic resists the mineral buildup and corrosion to which copper often succumbs. Even better: PEX stands up admirably well to freezing temperatures, unlike metal pipes that freeze and in severe cases, burst open. In other words, “for many plumbing applications, you can’t do any better than PEX,” says Daniel O’Brian, a technical specialist with leading online vendor SupplyHouse.com. PEX-A The strongest, most durable, and most flexible option, PEX-A boasts the unique ability to recover from kinks. Normally, if a section of tubing were to become damaged or deformed, you’d have no choice but to remove and replace it. But with PEX-A you can use a heat gun to restore it to its original state. Overall, and for tight spaces in particular, “it’s hands-down the best,” O’Brian says. PEX-B As you may have guessed, PEX-A commands the highest price. If you’re planning a project that involves, not tight turns, but long, straight runs, you can save money by opting of the next best option, PEX-B. Trading flexibility for rigidity, “PEX-B excels in a number of common applications,” O’Brian says. But there’s a downside to its stiffness: “PEX-B breaks where PEX-A would bend,” a fact that not only limits its utility, but also complicates the installation process at times. PEX-C “PEX-B and PEX-C are pretty interchangeable,” O’Brian says. If there’s a practical difference between the two, it’s their relative hardness levels. “PEX-C is the softer of the two,” O’Brian continues, and for that reason, “it’s more vulnerable to kinks.” On the plus side: Because a different manufacturing process goes into PEX-C, it typically costs less than PEX-B. If you’re taking on a demanding project, though, bear in mind that to an extent, “you get what you pay for,” O’Brian says. PEX-AL-PEX The most expensive of the bunch, PEX-AL-PEX, also known as aluminum-barrier PEX, features a special construction—namely, an aluminum layer that goes a long way to help the tubing keep its shape once bent. That means PEX-AL-PEX eliminates the need for the installer to employ tie-downs every few feet. In addition, because the aluminum layer doubles as an oxygen barrier, PEX-AL-PEX often plays a role in heating systems whose components would corrode if exposed to oxygen. For help choosing the right type of PEX for your next project, get advice from leading vendor SupplyHouse.com, or watch the SupplyHouse.com video below for further details on the considerations involved in selecting among the options available.